Creativity combines what we have already learned with new ideas from our imaginations to produce something needed and/or novel by ourselves or others. In other words, information from the past can be an “idea reserve” for future ideas. Every parent knows children possess a wide range of pre-existing knowledge. It affects their memory, reasoning, and analytical skills along with their ability to gain new concepts or create new ones. A child, in essence, makes a choice on how to respond to a situation (like combining new ideas) and often these “choices” can be guided by a helpful caregiver. Cooking is an opportunity to use creativity. Chefs try to push creative boundaries through their plated dishes in restaurants all the time, eager to get patrons wondering “What will happen next?”. While you and your kid(s) aren’t seeking Michelin stars (well, not yet anyway), coming up with new food ideas can be fun! This type of thinking comes in handy when working with whatever you have on hand to give your family that “Wow! Didn’t know you could eat it that way!” feeling. By thinking about the “Zone of Proximal Development,” a term coined by educational researcher Lev Vygotsky, a parent/teacher can work to help a child with skills they are developing by being an agent or support rather than a teacher simply lecturing what to do in a particular cooking scenario (2). He also used the term “scaffolding” which we can also direct into the kitchen by thinking about where a parent/teacher can demonstrate a skill (perhaps stirring) and then step back and let the child repeat that skill and offer help as needed. This can be applied to creativity. A parent can start listing all the possibilities of carrot cooking, then step back and let the child think of their own contributions while giving assistance or suggestions in thinking. If children are encouraged to be creative early on, they will continue this process of thinking beyond elementary stages of life. Self-reflection is an aspect of creativity with the assistance of others’ comments (i.e., critical, useful, aesthetic, etc.). Thus, caregivers can provide cues such as praise or constructive positive criticism. It is the child’s choice of how to use these cues, to either give up on an idea or continue to push through with adjustments. This criticism is similar to the idea of social support researchers have found at the time of one’s creative breakthrough where new ideas blossom (3). That is why it is important to identify and foster creative potential and assist children in their development of creativity (4). One way to think of creative knowledge is that children are born with a certain set of creative potentials and it depends on their surrounding environment (home, school, friends) for those potentials to unfold. How many ways can we use this ingredient? (Divergent Thinking - See below!). By having the appropriate surroundings (such tools to suit their needs, ingredients that are interesting, a parent willing to dive into the unknown and help! ), it also important to develop specific creative skills. One of the ways we can do this is through divergent thinking. Within intelligence research, divergent thinking (coming up with many ideas to answer a single question) versus convergent thinking (arriving at a single answer through a process of logical steps) is often used to describe a creative person's thinking process (5) . In cooking, you can share with your budding cooks that many chefs engage in divergent thinking all the time! Having many answers, solutions or recipes make the culinary arts more interesting. Tapping into creativity can be helpful in learning new skills with similar circumstances, settings, and steps. By retrieving past ideas and applying them in new ways we can come up with multiple ways to produce novel ideas. A Simple Way to Rethink Food: What Can We Do With a Carrot? There are many ways to use ingredients. Children witness, in most cases, what it takes to construct a tasty meal in many different ways. This is a very important part of culinary education. One way to foster divergent thinking (thinking of as many ideas as possible) is to select a single ingredient and come up with multiple ways of use. Creative prompt for your kid chef: “Today we have carrots (or other food item).” How many ways can we use carrots (or other food item)? Whatever you have in your kitchen [part of the fun! ], Notepad, Paper, Crayons or Markers. “How can we use mint (or another food item)?” List possibilities on a board or piece of paper. Have children come up with their own ideas by either writing and/or drawing pictures. 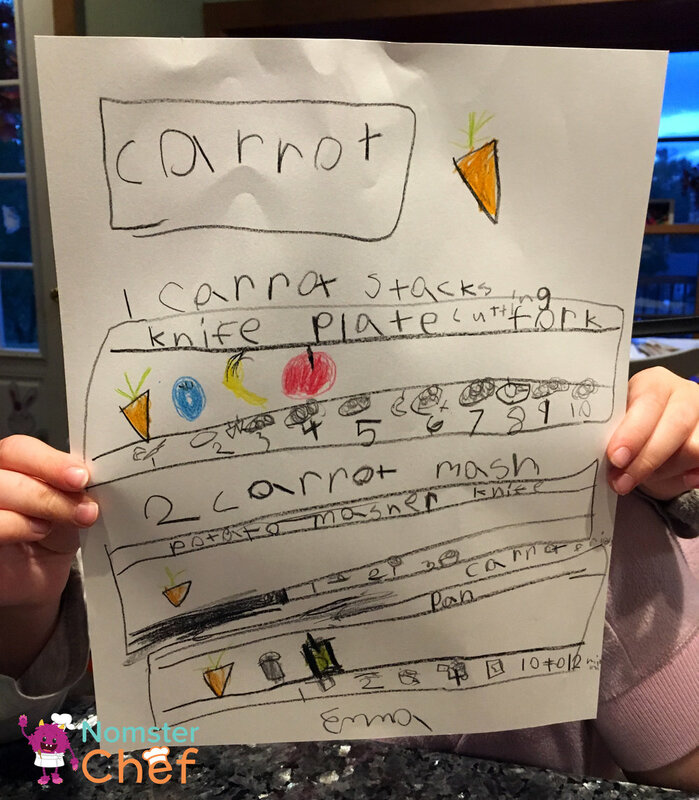 Emma’s ideas for carrot dishes: 1) Carrot Stacks 2) Carrot Mush (she wanted to provide a tasty treat to any babies that stop by 3) Carrot Fries (she remembered that other veggies could be fries and wanted to try out carrots instead of potatoes!). Gathering the actual ingredients for visual aid. Brainstorm how we can use it (types of dishes, cut up, whole, cooked raw). *Your kid chef has practiced culinary creativity just by thinking of all the ways to use an ingredient. If you don’t have time to actually cook one of her ideas, no problem! Chef Emma’s Carrot Stacks recipe in progress. This idea included making a visually appealing platter of fruits and vegetable. Not all of the ideas have to involve heat (i.e. cooking the ingredients). Here, Emma practices her plating and balance (as in art terms!) skills. Talk about the ingredient characteristics (taste, shape, density). Talk about additional ingredients you might add to the focus ingredient and how they might be prepared. If a child is stuck: parent come up with one idea or provide them with a prompt such as those possibilities below. Parents are welcome to think of their own! Do you remember when we had carrots? What do you think we can do with a cooked carrot? What can we do with a mashed carrot? Can we bake a carrot? Can we fry a carrot? Can we shred a carrot? Once you’ve made a plan, execute the plan and cook your recipe! Parent and kids reflect on what went right and wrong! Would you try this again? Does it taste good? Why? Chef Emma would definitely make this again. In fact, she’s planning on making it as a Thanksgiving appetizer this year! Let the children know the importance of creativity. Creatively combining flavors takes time. Some combinations might result in “yuck” and others may yield “yum.” The important thing is to exercise the brain and think of many possibilities. Don’t limit ideas to main dishes. You can also include breakfast, lunches, and snacks. Other creative variations can be based on dietary needs. How can we make non-meat based or gluten-free ideas come to life? Let kids lead the way when they come up with a new idea (even if you know it will be yuck, actual hands-on experience help them learn what doesn’t work for themselves). Explain that sometimes making new combinations can still be tasty. (1) Kindler, A. M. (1997). Child development in art. Reston, VA: National Art Education Association. (2) Vygotsky, L. (1987). Zone of proximal development. Mind in society: The development of higher psychological processes, 5291, 157. (3) Gardner, H. (1993). Seven creators of the modern era. Creativity, 28-47. (4) Torrance, E. P. (2002). Future needs for creativity research, training and programs. The future of creativity, 1-10. (5) Guilford, J. P. (1956). The structure of intellect. Psychological bulletin, 53(4), 267. 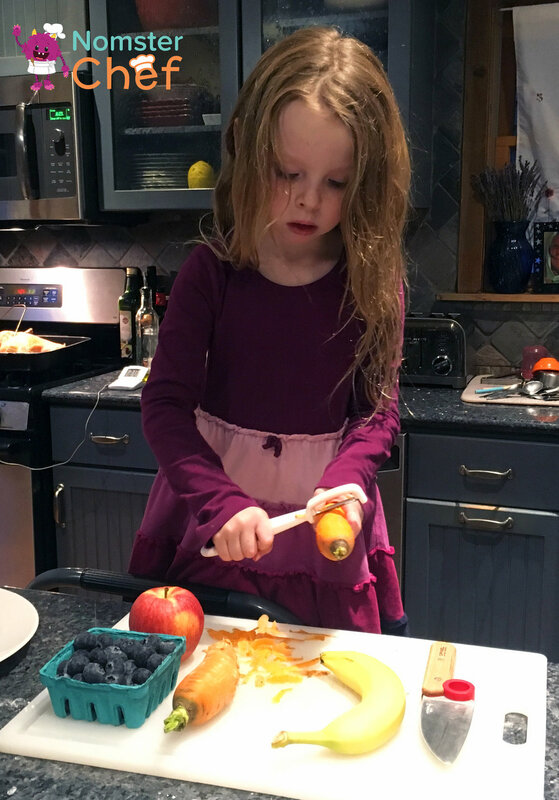 Jamie Krenn writes the "Learning through Cooking" series on the Nomster Chef Blog and contributes to Nomster Chef's illustrated recipes for kids. She is also an adjunct assistant professor heading the Children's Media: Analysis and Evaluation area of focus within the master's program of Cognitive Studies and Education at Teachers College, Columbia University. Her research interests include cognitive media processing, children’s television and culinary cognition. Emma Krenn is a Junior Assistant to Jamie Krenn at Nomster Chef. She is currently an elementary school student studying letters, karate, numbers, and French. Emma loves to cook with her mommy and often makes up her own recipes. Her favorite things to cook are 3-Day Croissants, gluten-free chocolate chip cookies, "whatever we have in the fridge" salad, roast chicken and Saturday morning pancakes with her Daddy, Steve.